Obituary/Biographical Profile: Private Alexander Aiken, Co. C; Contributed by Patrick Lordan, great great grandson on Pvt. Aiken. Post War image of Pvt. Alexander Aiken, Co. C.
A.M. Akin Dies After Long Illness. A.M. Akin, a resident of Pullman for the past 15 years died at his home in this city Monday morning after a long illness. Funeral services were held Wednesday afternoon, conducted by the Rev. Leo L. Totten, assistant pastor of the United Presbyterian church. Alexander Murray Akin was born near Portersville, (Beaver Co) Pennsylvania, March 23, 1840, and grew to manhood at the place of his birth. At the opening of the civil war, he heard his country’s call and enlisted in the famous One Hundredth Round Head regiment, (Private, Company C) in which he served for three years and 11 months. On April 25th, 1867, in Washington county, Iowa, he was married to Miss Alice Mather, and to the union 12 children were born, of whom 10 survive. 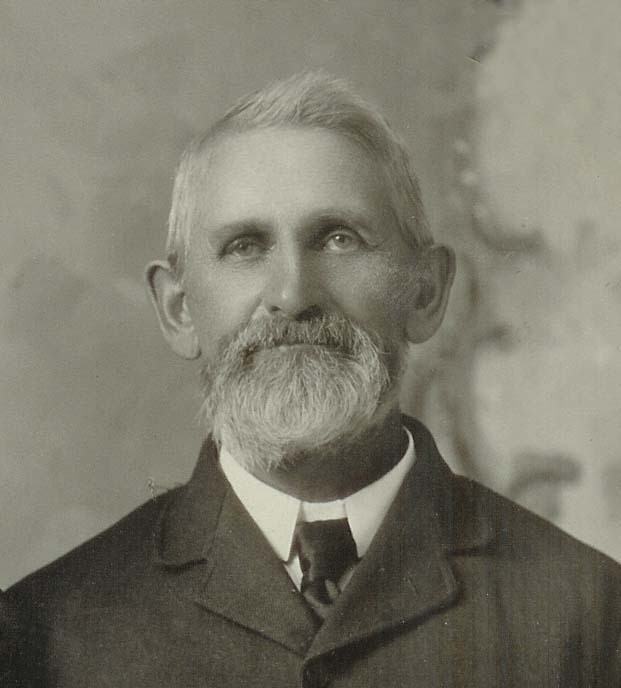 Mr. Akin was one of 14 children, although only one sister, Mrs. O. Mitchell of Pullman is still living. Mr. and Mrs. Akin removed to Kansas in the fall of 1869, where they made their home for 30 years, coming to Pullman in 1899. Mr. Akin lived a Christian life, having been associated with the United Presbyterian church for many years. His death followed a long illness and a gentle decline, after he had lived for 74 years, nine months and 18 days. Besides his wife, Mr. Akin leaves 10 children and 12 grandchildren to mourn his death. The children are: Samuel M. Akin of Kansas; Mrs. George Ewing of Pullman [WA]; Robert A.B. Akin of Seattle, Wash; Miss Frances Akin of North Yakima, Wash.; Henry O. Akin of North Yakima, Wash.; Junius W. Akin, Nez Perce, Idaho; N. Jesse Akin, Olympia, Wash.; Mrs. Charles Philips, Mt. Vernon, Wash.; and Miss Alice Akin of Mt. Vernon.